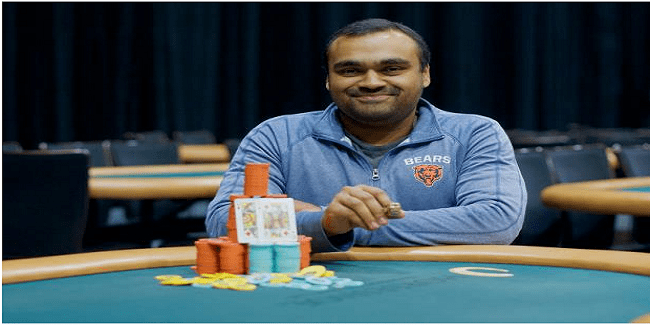 Ravi Raghavan of United States is the latest champion of Hammond Casino championship and pocketed $133,000 as first prize of $5,300 buy in High Roller. Before this high roller event another event took place which was the main event of the festival. The $1,675 buy in event attracted 1,308 entries which is seventh largest in this main event of WSOP Circuit in last 13 years. Raghavan had 328,500 in chips on Day 1A of the main event and began Day 2 in second place. He completed his day 2 sitting in 21st place among 28 remaining players. Meanwhile third day of the main event saw some early breakthrough and Raghwan was among them. He finished his journey to 16th place. By the time he hit the rail, he managed to receive an amount of $20,000 as winning share. However the other event to which Raghwan did great was $5,300 buy in High Roller. Raghwan did not want to participate in this event and that’s why he registered himself for the event in last minute. The event received 83 entries and Raghwan was the second last registrant. Only Jean Gaspard got in after Raghavan, while Gaspard was the first player as well who got eliminated on Day 2 of the game. After at least 10 hours of play most of the tables were empty because almost all players were out of the game. The two remaining players of this particular high roller were Raghavan and Keven Stammen. And it was Raghavan who didn’t made any mistake here at the heads up and defeated Keven Stammen. He collected $133,000 as winning share and added another 50 points to his point table, which made him to lead over Art Harb, the previous casino champ of Hammond.